Ferris Bueller was a man of the people–an 80’s pop culture icon created in the era of John Hughes’ brilliance. Ferris’ words continue to find footing thirty years after audiences caught their first glimpse of the vested hero on the big screen. He was right–life does move pretty fast. In our current culture of instagramification it can require some serious effort to slow down, stop multitasking and take a break from all of the Facebook updates and Tweets. Fortunately, there is a simple solution that often yields positive results–music. Music is that powerful catalyst that forces you to look up from the glow of your iPhone. When the sound of joyful voices melting together into a rich harmony hits your eardrum, you can no longer ignore the goosebumps on the back of your arms and the calming breath in your chest. Music pulls you away from all of the noise. It frees you. On their third studio album, Old Time Reverie, Mipso serves up just that–freedom. Sitting down with this album transports the listener back to a simpler time, though not one without its own set of obstacles, as evidenced by the album opener “Marianne.” With a happy fiddle playing peek-a-boo throughout the song, one may mistaken “Marianne” for a jovial tune. Lyrics tell a different story, one of the forbidden love of an interracial couple in 1960s North Carolina. Mipso sets the storytelling bar high with “Marianne,” a familiar approach for the band’s album openers–hook the listener from the get go and hold ’em ’til the end. “Down in the Water” follows with Rodenbough’s timeless, crisp vocals at the forefront. The simplicity and tone of the song feel hymnal, even baptismal at times. However, the beauty of the song emerges in its content and transcends church walls as Rodenbough pleads for a quiet and content mind–a very relatable request. “Eliza,” a lover’s plea laced with three-part harmonies, brings a little folky waltz to the album and is sure to be a live fan favorite. On “Bad Penny,” Terrell hits the ground running, taking listeners on a wild lyrical goose chase with his ever evolving gift of storytelling. The song’s fiddle line elicits images of a Smoky Mountain family feud, even though the story unfolds in modern-day NYC. It is in playing with these lyrical and musical contradictions that Mipso continues to grow and evolve as a group. With Sharp on lead vocals, “Momma” tugs at the heartstrings, combining a Simonesque melody with Mipso harmonies and honesty. “Father’s House” highlights the gospel influence that often accompanies Mipso’s bluegrass roots. Here the band uses religious imagery to tackle feelings of isolation and uncertainty in life and death. “Captain’s Daughter” sets sail on the high seas, telling the story of a lonely seaman who yearns to reunite with his land-bound love, Annabelle. Rodenbough’s fiddle brings in Celtic tones, transporting the listener across the pond to a more rustic land where passion is fierce in both love and trade. “Stranger,” a more modern love ballad for the group, pumps the brakes while breaking hearts. “Honeybee” picks up the pieces and brings in a bit of sweet springtime sunshine. Terrell convinces listeners that he’s singing from a very personal space, though in his songwriting prowess perhaps he’s just that good. “Everyone Knows” slithers in with a desperado darkness, fit for a Tarantino flick. Though a bit of a departure for Mipso, it stands tall as the album’s best track. On “Everyone Knows,” Mipso stepped out boldly into the dusty town square, pulled their pistols and walked away unscathed. The only thing missing now is an accompanying video. Jon Kasbe get your camera ready. The album closes with “4 Train,” a love song set to a steady locomotive cadence. Touching on familiar emotions that accompany love, “4 Train” shines a spotlight on each band member’s talents, book-ending the album perfectly. Old Time Reverie offers listeners a solid collection of stories, steeped in traditional acoustic instrumentation and tight-knit harmonies at a steady rocking chair pace. With each listen, you may find it easier and easier to pull yourself away from the hustle and bustle and take a moment to really live inside the beauty of a carefully crafted song. Ironically, the members of Mipso weren’t even born when Ferris first delighted downtown Chicago with his famous renditions of “Danke Schoen” and “Twist and Shout.” Yet, somehow they collectively possess his spirit, charm, and ability to captivate an audience. On Old Time Reverie, Terrell, Sharp, Robinson and Rodenbough further reveal the old souls that live in their youthful vessels–wise beyond their years, much like Mr. Bueller. Mipso is a four-piece folk/bluegrass band out of Chapel Hill, NC consisting of Joseph Terrell (guitar), Wood Robinson (double bass), Jacob Sharp (mandolin) and Libby Rodenbough (fiddle). The Chapel Hill-based bluegrass band Mipso spent some quality time last Summer touring through Japan, getting immersed in the Japanese culture and growing bluegrass movement. University of North Carolina alum and award-winning film maker Jon Kasbe traveled to Japan with the trio to capture their experience and share it with the world. The result below is a strikingly beautiful documentary that highlights the unharnessed power of the universal language of music. On a beautiful day in May, band mates Wood Robinson, Jacob Sharp, and Joseph Terrell tossed their mortarboards up into the Carolina blue sky and rejoiced in the finality of their collegiate journeys. With degrees in hand, this Chapel Hill-based trio known as Mipso, threw all thoughts of conventional careers out the window and collectively vowed to make the band their top priority. It was time to put the music first and bring the sound of Mipso to the people of North Carolina and beyond. Their first stop—the recording studio. On the band’s second LP, “Dark Holler Pop,” Robinson (double bass), Sharp (mandolin) and Terrell (guitar), adopted a more collaborative approach to songwriting. With producer Andrew Marlin, of Mandolin Orange fame, behind the soundboard, the band was able to sit back, learn, and let the songs evolve organically in the studio. The album’s folk-bluegrass sound was further rounded out by industry greats like Marlin, Emily Frantz, Phil Cook, Chandler Holt, John Teer, Bobby Britt, and Chris Roszell. Released last month, the 11-track album debuted at #8 on Billboard’s Bluegrass Albums chart. Collectively, “Dark Holler Pop” is North Carolina through and through, featuring Mipso’s blended interpretation of Appalachian music with strong three-part harmonies and traditional instrumentation. While banjo rolls and a punchy mandolin lend the album a fuller bluegrass sound, the sweet whine of the fiddle really shines as it meanders seamlessly from track to track. “Louise” stands out as one of the best tracks on the album. Lyrics tell a love story through car metaphors, an authentic approach by this group of young men. What better way to describe the bumpy road of love than by comparing it to an old beat up car? Another gem is “When I’m Gone,” a beautiful hymnal ballad laced with delicate guitar picking and a church-worthy chorus. Mipso slows things down with “Rocking Chair Blues,” evoking images of an old man pondering his life on the front porch of a creek-side cabin. Songs like this reveal the old soul that is at the epicenter of Mipso. These musicians have somehow gained the perspective of a seasoned sage somewhere along the paths of their relatively short lives. Thus, it is not surprising that themes of mortality and decades of hardship find their way onto many of the album’s tracks. The album closes with “Do You Want Me,” which is the first to feature a flirty piano arrangement. Supported by their trademark tight harmonies, Mipso sings of love’s most brutal insecurities, as the song transitions from a polished studio sound to what sounds like a raw live recording. Overall, “Dark Holler Pop” further solidifies Mipso’s place in modern folk and bluegrass genres. Their decision to work with Marlin and elevate their songwriting makes this album a big success and one that will certainly get ample radio play. With lyrics heavily weighted towards the trials of love and life, it will be interesting to see how touring and life on the road will shape Mipso’s songwriting for their next installment. Until then, “Dark Holler Pop” will keep on spinning. Sometimes first impressions are meant to be thrown out the window. This is because, in fact, impressions aren’t formed in a vacuum. Rather, they are often influenced by external and internal factors–weather, mood, people around you, time of year, personal conflicts, perceived reality–the list is endless. 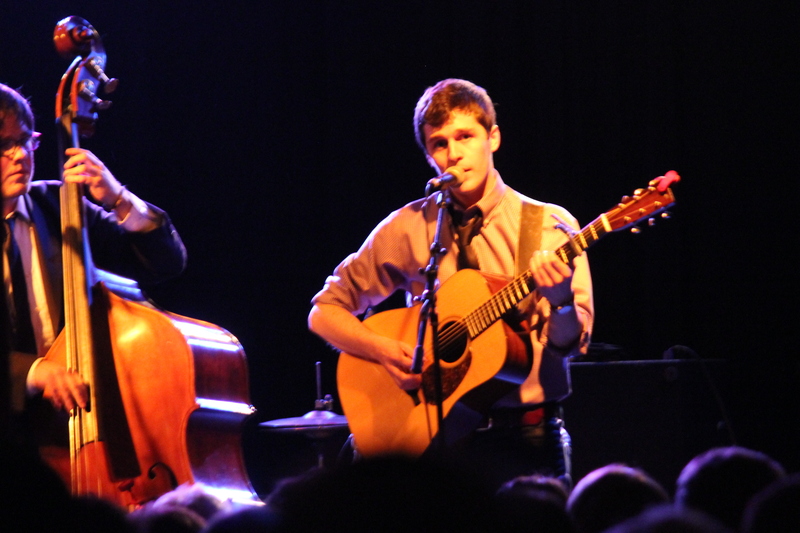 The first time I saw Mipso (then Mipso Trio) perform was at their sold-out show at Cat’s Cradle last year–a Carrboro music staple on the outskirts of the pristine campus of UNC-Chapel Hill where band members, Jacob Sharp, Wood Robinson, and Joseph Terrell studied. Life was good, they were making music together, and they had sold-out one of the area’s most recognized venues. To top it off, Mipso was being supported by some of the state’s best songwriters that night, openers Jim Avett and The Overmountain Men. What more could these young, talented men ask for? Onstage they appeared starstruck and in awe that so many people came out to see them–as they were still in their infancy as a band–but they proved to have some veteran tendencies. 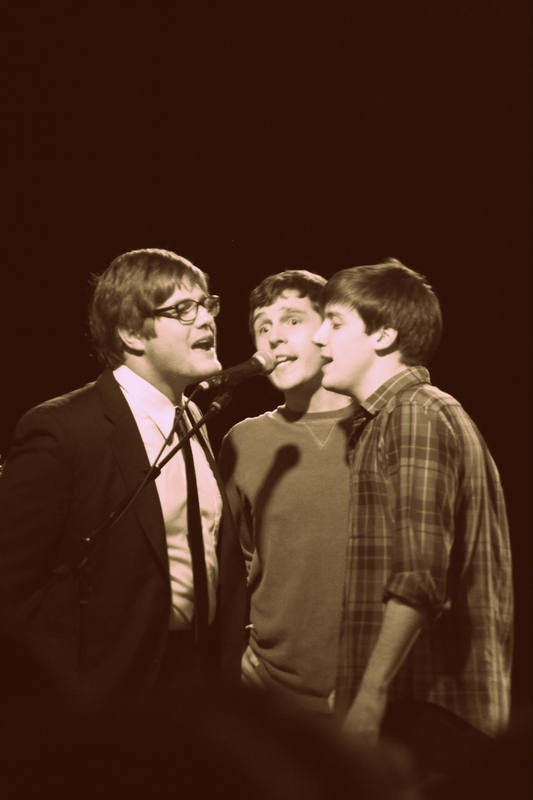 Their harmonies were tight, crisp, and clear. They smiled out into the bright lights beaming back at them, and had a natural stage presence. When David Childers joined them on stage, they appeared humbled and honored. Whatever kinks were worked out on stage were hardly, if at all, noticeable to the audience, because of well, the audience. Here is where first impressions get influenced if we aren’t careful. Drunk college co-eds who would rather be seen and heard than to listen to well-crafted music were wall to wall that night. They were successful in putting a blemish on my first impression of Mipso. It was sort of that ‘guilt by association’ rule. If this audience was made up mainly by friends of the band, well how serious were they about making a mark on the North Carolina music scene and beyond? I left disappointed, but thankfully not completely despaired. You see, occasionally I forget that there was a time when I was not a polite concert-goer–when I, too, was a drunk co-ed. So, with that in the forefront of my mind, I set out to form a new first impression of Mipso, one based on the important elements of a band–the music and the people. 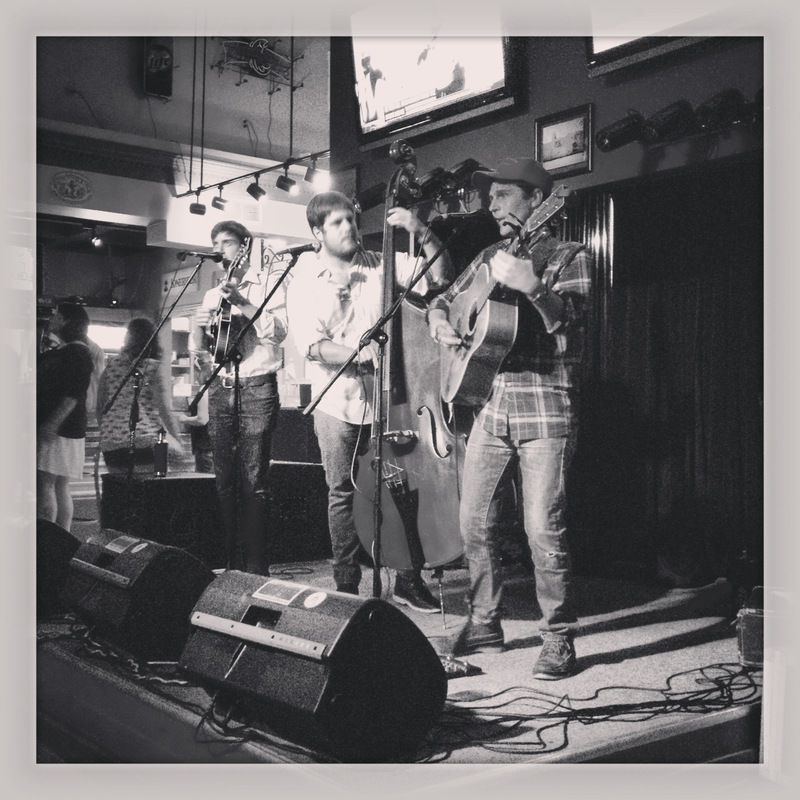 I caught up with Sharp, Robinson, and Terrell last month at Peasant’s Pub in Greenville, NC for a little chat about the past year, growing as a band, songwriting, recording their upcoming second LP, and surprisingly, the bluegrass movement in Japan. As we nestled into our seats on the patio, I quickly learned that these young men possess a depth and maturity that is rarely found in recent college graduates. Sharp, on vocals and mandolin, picked up the instrument in the eighth grade off a bet with his Dad. “I picked it up and hit it with various things, but don’t think I really started playing it until I was sixteen or seventeen,” Sharp recalled. Robinson, on stand-up bass, has been playing music in some capacity since he was three or four years old. With a strong foundation in jazz theory, he picked up the electric bass in 8th grade and transitioned to the stand-up by the time he was mid-way through high school (June 22nd to be exact–he joked). Terrell, on guitar and vocals, learned to pick from his grandmother while in middle school, and started playing in bands and taking his craft seriously by age sixteen. Collectively, they each bring a different type of songwriting prowess to the table. On their first full album, Long, Long Gone, Terrell was the primary songwriter, but the responsibility has shifted on their upcoming untitled album as Sharp and Robinson throw a few songs into the mix. “I think [the melody and lyrics] inform each other. I don’t often have lyrics sitting around. Often times I have a lyrical idea with a melody. They tend to come together. Some songs come quickly and then I’ve got a notebook that’s got some stuff that’s half-finished and they will be half-finished for six months. It’s a labor of love that you always have to pay attention to because you never know which idea will fit,” shared Terrell. It is obvious that this next album will be more of a collaborative effort among the band. This approach not only challenges them personally, but also pushes them to learn how to work together to produce a sound that is ultimately unique–a sound that is Mipso. “I think with collaborative writing, someone brings an idea and you flush it out together. Or sometimes Joe or myself will bring a finished song that doesn’t need too much beyond working out the parts. But we are still learning how to write together,” said Sharp. While Mipso wouldn’t categorize themselves as a strictly bluegrass band, they certainly pull inspiration from the traditional genre, and do so with the utmost respect. “So, bluegrass players are really good, like virtuosos. There is a distinct level of virtuosity in that genre of music that would not be fair to claim as our own,” pointed out Robinson. 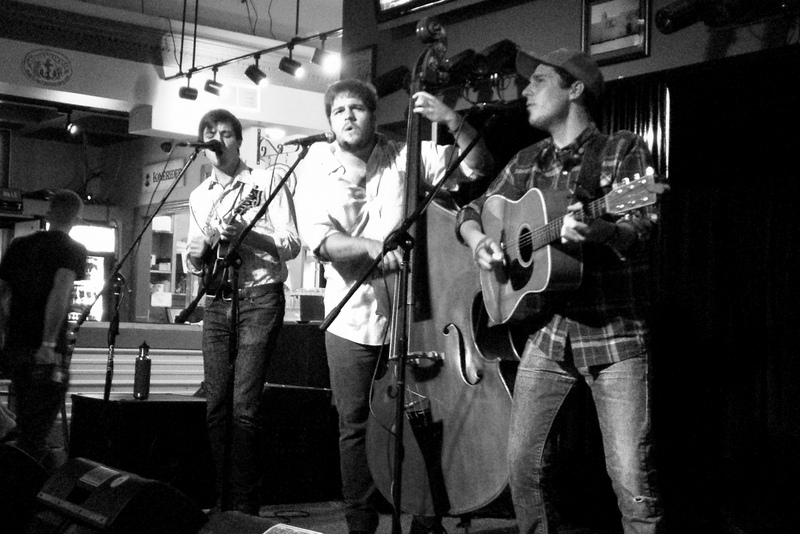 “I think we are influenced and inspired by bluegrass. So I think we are bluegrassy in the same way we are folksy,” added Sharp. When you sit down to listen to Mipso’s previous work, it is clear that their influences run the spectrum, from Paul Simon to Doc Watson. As they continue to define their own signature sound, much of that fine tuning has been taking place in the recording studio. On their upcoming album, they are working with producer Andrew Marlin at the Rubber Room Studio in Chapel Hill. Marlin, who is best known as half of folk-bluegrass duo Mandolin Orange, has signed on to guide the recording process. With Marlin behind the boards, Mipso has gained a mighty mentor who is proficient in all areas of production. “It’s very cool to have an external source, to have a very deliberate and apparent hand in the process of writing these songs. We bring these songs with an idea of where we are going with them, and having another person outside of the band say, ‘Hey, this should be slowed down a bit. Maybe it could use a little snare in it.’ Is amazing how those little things can bring out the character of the song in such a beautiful way,” said Robinson. Also joining the guys in the studio will be their fourth band member, fiddler and singer Libby Rodenbough. When Mipso first started two and a half years ago, they were known as Mipso Trio–catchy right? About a year ago, they decided to drop the ‘Trio’ which happened to fall in line with the addition of Libby. Libby had already contributed to all recordings, so it seemed like a logical move. So what can fans expect from their upcoming second LP, slated to be released in late October/early November? Based on the album’s first single, Carolina Calling, themes of state pride and family roots rise to the surface. However, the band shared that thematically the album will expand from the epicenter that is the only home they’ve ever known–North Carolina. “I started thinking about graduating in November [’12]. I’m used to this place–North Carolina and Chapel Hill–but it would be cool to capture what this place is to me and all of us at this moment in time. I took the project on of writing the song that I felt was the senior spring song. It’s Chapel Hill-centric, but also about North Carolina. There’s something special about being in North Carolina that you don’t get in other places. That’s the idea I had [for the song],” explained Terrell. In terms of the feel of the entire album, they believe that it will have an elevated sound–even more ‘Mipso’ than before. “I think we’ve grown into our shoes a little more since the first album. I think it’s easier than on the first album for people to say, ‘Oh that’s kind of a bluegrass song.’ Now they sound more like Mipso songs,” Terrell proudly stated. “You can see very direct themes in the last album–home, leaving home, coming back home, loves and lost loves, and certain other things–but it is kind of cool to be pushing our comfort zone for thematic writing [on our new album],” added Robinson. While quality songwriting and recording are necessities for any band to be successful, so too is becoming integrated into a local music scene. Luckily, the North Carolina music scene is welcoming, even as it busts at the seams with talent. While Mipso carves away a place in the music scene, the band also pulls inspiration from those who have paved the way. “It’s so important to be a part of a music scene, and North Carolina music scene is awesome. Two of my favorite bands are Chatham County Line and Mandolin Orange. They are awesome and right around the corner from us,” said Terrell. In addition to their local music scene, Mipso is making a concerted effort to establish roots first throughout North Carolina, and then beyond. Since graduation in May, the band has been able to look forward with a new sense of direction and intent. “For us it’s exciting because this whole year will be very focused and intentional. It was always something we just did on Fridays and Saturdays. It’s cool that it feels much more embodied and fully a part of our lives,” explained Terrell. “As far as getting further afloat from North Carolina, it’s really a big goal of ours to first be really rooted here, to cover the state pretty thoroughly, because we keep learning about all of these cool communities. So, it’s fun for us to explore. Lots of them are places we’ve been as kids or something but never knew there’s this great music scene. That’s really exciting for us, and it also makes more sense to move out in smaller circles and just keep widening the radius,” added Sharp. Establishing their musical roots in North Carolina means playing local venues–anywhere from general stores to house show living rooms. Mipso plays a Charlotte house show, sponsored by Common Chord Concerts, this Friday (7/12), and has plans to continue touring throughout North Carolina, West Virginia, Tennessee, and Connecticut. When I asked them if they had plans to tour out West, I was quite surprised by their response. “Well we’ve got an idea about going East,” said Terrell with a laugh. I was perplexed. Out East? Mipso certainly has an exciting tail-end of the year ahead, including an overseas tour and putting the finishing touches on their second LP. Despite their steady growth as a band, Sharp, Robinson, and Terrell know that they still have mountains to climb, and they are very comfortable with that. Mipso doesn’t seem to carry the sense of urgency that would be expected from a group of recent graduates. They all possess a realistic level of patience that seems to be lacking in our world of instant gratification–which in itself is quite gratifying. As they move forward together, they pay special attention to the lessons put forth by their mentors, including one of North Carolina’s favorites, David Holt. That evening those at Peasant’s Pub were treated to an excellent two-set show. They were engaging and filled space between the songs with witty banter that held the audience’s attention. This time around I was able to appreciate Mipso’s set from a better vantage point. On stage, their awestruck quality was replaced by an ease, as they appeared much more comfortable and at home in their songs. The songwriting had matured, which was evident in the new songs they played. They even threw in a crowd-pleasing cover of Michael Jackson’s Billie Jean, which showed not only their sense of humor, but also their ability to cross genres and make a throwback song their own. I was pleased to leave that evening with a new, shiny and fair impression of the band and their music. Mipso is moving in the right direction, at a smart and steady pace that exudes a quiet confidence. Armed with patience, talent, and big dreams, these young men will continue to gain fans as they travel the globe and share their songs and stories.